What Active Ingredients are Contained in Ginger? Is Ginger Suitable for Everyone? Ginger is one of our best known and most health giving spices. It’s officially known as zingiber officinale and is originally from China. Ginger has been traditionally used for thousands of years in both Chinese and Ayurvedic medicine. Many ancient texts record the use of ginger to improve health. We always take an evidence-based approach and aim to equip you with actionable knowledge and tips to help you on your journey to optimal health. 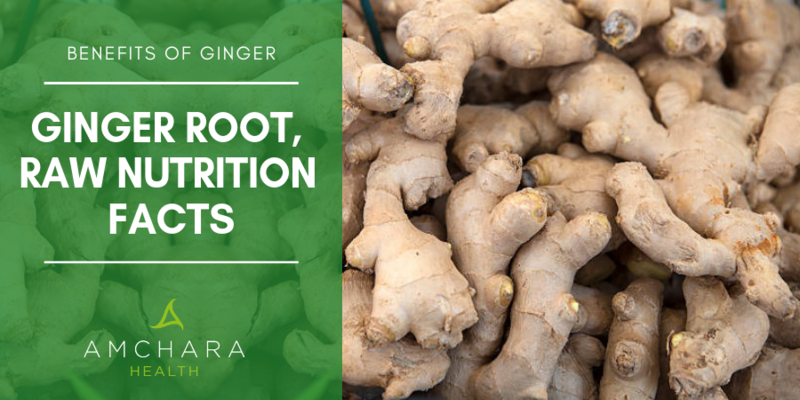 This article will look at some of the ginger’s health giving properties which are backed by modern science. Ginger is a rhizome (a subterranean plant stem or root stalk) and belongs to the Zingiberaceae family - the same family as turmeric. It’s also related to cardamom and galangal. We consume the root of the plant, but it also produces greenish, purple flowers. Ginger is famous for its antibacterial and anti-inflammatory properties and contains a good quantity of beneficial antioxidants. The main compounds in connection to health are a family of substances called gingerols, which give ginger its pungent flavour. It also contains related substances called shogaol, paradol and zingerone. Gingerols and shogaol have been shown in studies to be powerful antioxidants. 100g fresh root contains around 10% of the recommended daily nutrient intake of potassium, manganese, magnesium and copper, along with small amounts of vitamin C, vitamin B6, niacin, phosphorus and iron. Let’s have a look in detail at some of the proven beneficial effects of eating ginger. Gingerol possesses powerful anti-inflammatory effects. Inflammation is the normal response of the immune system to injury and infection, but chronic inflammation is thought to contribute to chronic illnesses such as heart disease, obesity, diabetes and even cancer. One review of research concluded ginger may help reduce the production of various inflammation markers and inflammatory molecules (1), and a study specifically examined ginger’s effects on the growth of prostate cancer cells in a test tube. The researchers found it significantly inhibited the growth of the cells (2). Because of its role in inflammation, ginger may also help to reduce the likelihood of allergic reactions. The anti-inflammatory properties of ginger have been shown to relieve gastrointestinal irritation and prevent spasm of the digestive system, so it can be helpful in IBS. Ginger also stimulates the flow of saliva and bile. It also appears to increase the release of certain digestive enzymes which help us break down our food. These properties make it a great all round digestive tonic. Ginger has traditionally been used as a remedy to reduce nausea. It’s often used to combat morning sickness in pregnancy, and this has been supported by clinical research. Ginger has also successfully been used to reduce nausea following surgery (3) and after chemotherapy. Evidence suggests it may be as effective as prescription medications against seasickness. 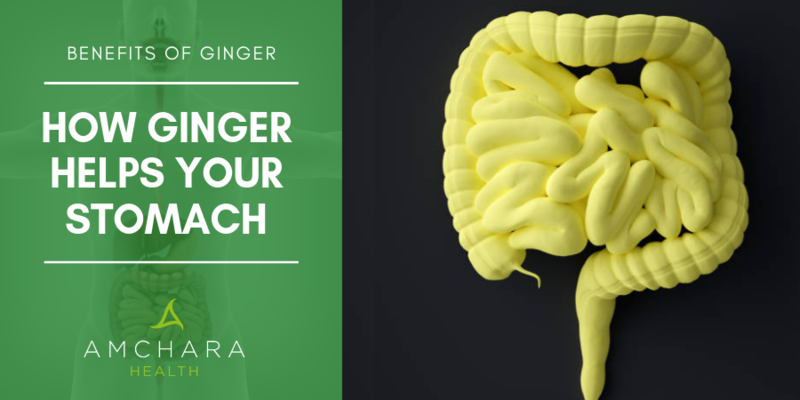 The precise mode of action is unclear, but ginger is thought to block the action of specific receptors in the digestive system which contribute to sensations of nausea. Ginger appears to speed up stomach emptying in people suffering from indigestion. Delayed emptying of the stomach is believed to be one of the triggers for indigestion. Studies found taking a supplement containing ginger with a meal significantly increased the speed at which the stomach emptied. Ginger is considered to be a carminative - these are agents that can prevent or relieve flatulence. It appears to promote the breakdown of wind in the digestive tract. Stomach ulcers in the lining of the stomach can lead to indigestion, heartburn and fatigue. Studies have suggested ginger may be protective against developing stomach ulcers. One study in animals found ginger protected against stomach ulcers caused by aspirin and nonsteroidal anti-inflammatory drugs (NSAIDs), by reducing the levels of inflammatory substances produced by the body. Ginger has been found to reduce menstrual pain. In one study, a supplement of ginger powder taken on each of the first three days of the menstrual period reduced period pain as effectively as two commonly-prescribed anti-inflammatory drugs, ibuprofen or mefenamic acid (4). Both the intensity and duration of pain was reduced by the ginger. Ginger appears to affect cholesterol levels. Several studies have noted ginger reduces LDL ('bad') cholesterol and increases HDL ('good') cholesterol (5). Another study found ginger was almost as effective as a statin drug at doing this. Cholesterol is carried around the body by substances called lipoproteins. The relative levels of two lipoproteins, apolipoprotein A (apoA) and apolipoprotein B (apoB) are now thought to be better predictors of heart disease risk than levels of cholesterol. ApoB lipoproteins are most likely to enter the artery walls and can carry cholesterol with them, so initiating atherosclerosis. Studies have found ginger favourably altered apoB/apoA ratios. Research suggests ginger can help normalise blood sugar. Blood sugar which is elevated can be a risk factor for the development of Type 2 diabetes. In one study, ginger supplements significantly reduced fasting blood sugar over twelve weeks. Interestingly, the ginger also improved a marker for long term blood sugar levels. Gingerol appears to be a potent antibacterial and so can reduce the risk of infections, coughs and colds. Research has found ginger can reduce the growth of several different types of bacteria, even drug-resistant ones. Ginger is what’s known as diaphoretic, which means it promotes sweating. It’s great to take when we are suffering from a cold, as it warms the body from inside. It can be useful for a productive cough, which is one accompanied by mucus, but it can also be helpful in cases of a dry cough, particularly ones associated with asthma. It’s believed ginger helps relax membranes in the windpipe. Ginger has also been found to effectively destroy the type of bacteria which cause inflammatory gum diseases like gingivitis and periodontitis. In addition to its antibacterial properties, ginger may also be effective against viruses. In studies, it was found to inhibit to the activity of the RSV virus. This commonly causes cold-like symptoms and respiratory infections. 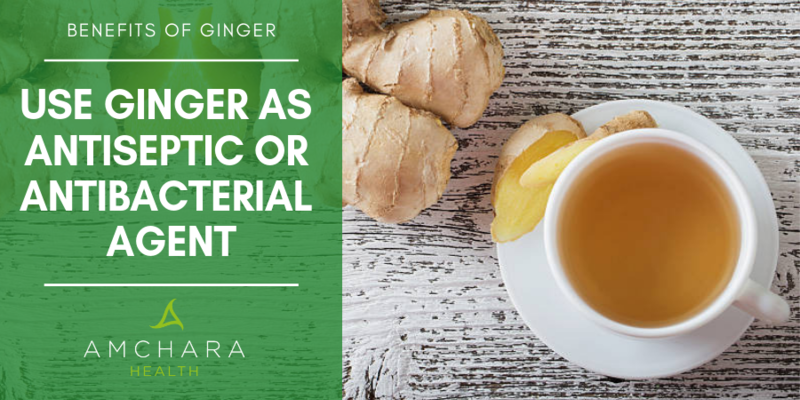 In one study, ginger extract was used successfully to combat two different types of yeast which are involved in fungal infections in the mouth. Ginger has been found to be one of the most effective anti-fungal agent in a long list of plant remedies (6). Now we know more about the anti-inflammatory properties of ginger, it should come as no surprise it has been found to be beneficial for muscle pain. One study found consumption of 2g of either raw or heated ginger reduced muscle pain from exercise by as much as a quarter (7). Ginger can not only be helpful for muscles but for joints too because of its anti-inflammatory action. Researchers looked at over 200 people suffering from osteoarthritis of the knee. They found those who took ginger extract experienced less pain. They also needed less pain medication. Ginger’s pain-relieving properties aren’t restricted to joints and muscles. According to one study, ginger decreased the severity and length of a migraine as effectively as a prescription drug. So far we’ve concentrated on ginger’s effects on the body. But it seems it can benefit brain power too. Both oxidative stress and inflammation have been suggested as contributors to neuronal conditions such as Alzheimer’s and Parkinson’s disease. It follows ginger could be beneficial, due to its antioxidant content along with its ability to inhibit inflammation. Studies on animals suggest ginger is able to protect against age-related cognitive decline by slowing the rate at which memory deteriorates. One study even found a higher density of brain neurones after taking ginger. The effects appear after a relatively short time period. One study on 60 middle-aged women found taking ginger extract for two months led to improved cognitive processing and attention, including decreased reaction times (8). When buying fresh ginger root, choose firm roots which aren’t shrivelled - this indicates the ginger has been kept for a while. To store, keep in an airtight container in the fridge. Ginger can also be frozen - just grate it as needed. Ginger is delicious in both sweet and savoury dishes, and as a tea. It can be used either fresh or dried as a powder, although fresh ginger packs a greater nutritional punch. Mince or chop finely and add to stir-fries, soups, casseroles, curries, marinades or salad dressings. Ginger goes well in Asian dishes, especially when combined with soy sauce and garlic. It’s great with salmon. Add fresh ginger to a smoothie or juice. Try ginger and apple juice as a pick-me-up in the morning, or a carrot, ginger and lemon blend to wake up your liver. Ground ginger can be used for desserts and baking. To make ginger tea, grate fresh peeled ginger root and steep in boiled water. Sweeten with honey if needed and add the juice of half a freshly-squeezed lemon. Make a delicious warming ginger sore throat-fighting drink. Combine a teaspoon of coconut oil with 2 cups warmed coconut or almond milk, 1 teaspoon turmeric, 1-inch fresh ginger root, peeled and grated, one-quarter teaspoon black pepper and 1 tablespoon, raw honey. Ginger has a long history of safe use, however, if you’re pregnant, or if you suffer from gallstones, don’t take high doses of ginger without discussing with your GP first. Ginger supplements shouldn’t be used with blood thinning medications such as aspirin or warfarin. 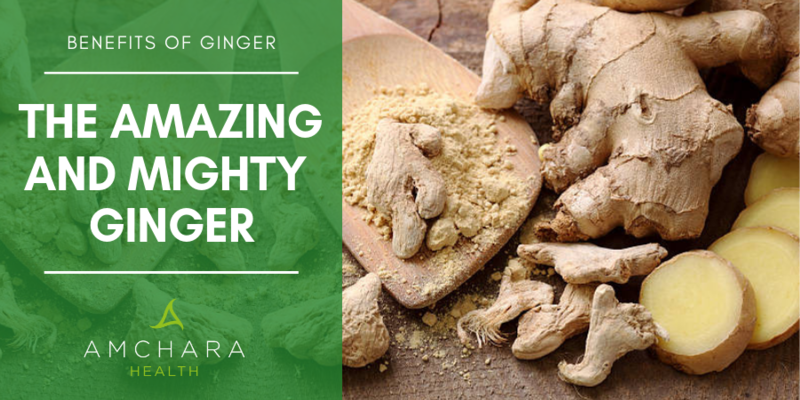 From joint, heart and digestive health to support for cholesterol levels and as a go-to remedy for coughs and colds, ginger deserves a place in your kitchen cupboard and your medicine cabinet too!